adding reviewers and additional admins. 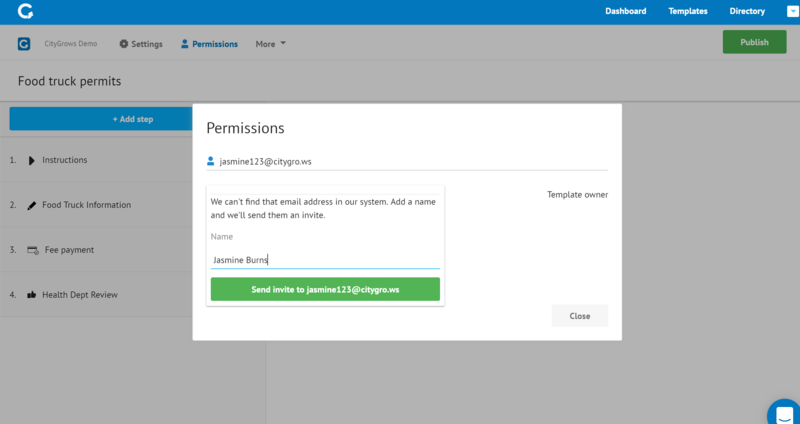 You can be an Admin on some processes, and a reviewer on others - your status is visible in the Permission settings of each Process Template. 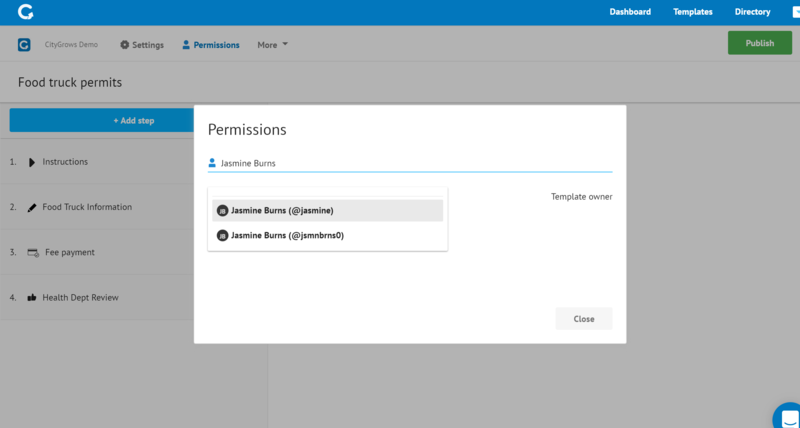 You'll probably want to have at least 2 people with Admin access to each Template you set up, just as a backup. 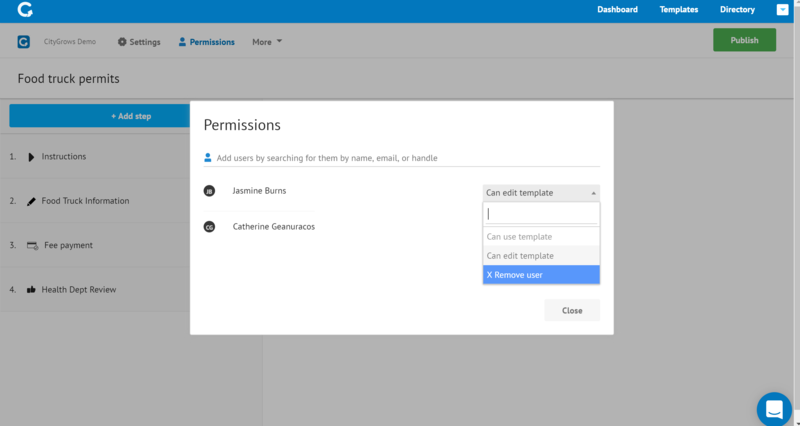 To add a new admin, open the Permissions section at the top of the screen visible when you're in "Edit" mode for a template. You can search for someone to add as an Admin by typing their name. If they're in the system already, just select their name. If they're not already in the system, you can add their email address and send them an invite. They'll be invited to create a CityGrows account and then added as an admin to the Template once they do. 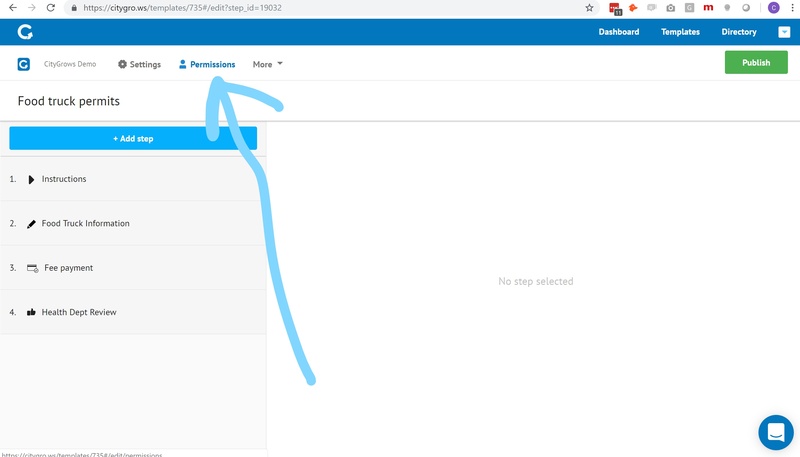 Once you add someone as an admin, you can select whether you want them to just "use" the process (for example, advance the process and fill in collect info steps for team member) or whether they can "edit the template." Editors have the ability to add or remove steps, fields, and change logic - basically full control of the workflow template, so share that access carefully. If you ever want to remove an admin, you access this same section of the Template Editor and select "Remove User." Unlike many other software companies, CityGrows doesn't put any limit on the number of admin users a government can have in our system. We want to encourage more people in your organization to use technology, not fewer!